Abstract. Methane is the second most important long-lived greenhouse gas and plays a central role in the chemistry of the Earth's atmosphere. Nonetheless there are significant uncertainties in its source budget. Analysis of the isotopic composition of atmospheric methane, including the doubly substituted species 13CH3D, offers new insight into the methane budget as the sources and sinks have distinct isotopic signatures. The most important sink of atmospheric methane is oxidation by OH in the troposphere, which accounts for around 84% of all methane removal. Here we present experimentally derived methane+OH kinetic isotope effects and their temperature dependence over the range of 278 to 313K for CH3D and 13CH3D; the latter is reported here for the first time. 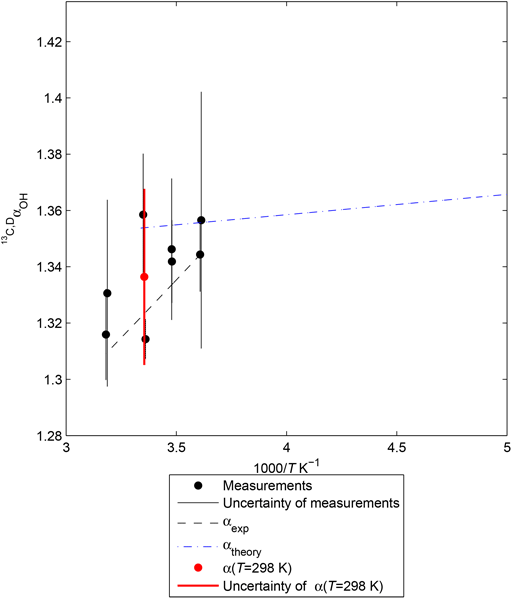 We find kCH4/kCH3D = 1.31 ± 0.01 and kCH4/k13CH3D = 1.34 ± 0.03 at room temperature, implying that the methane+OH kinetic isotope effect is multiplicative such that (kCH4/k13CH4)(kCH4/kCH3D) = kCH4/k13CH3D, within the experimental uncertainty, given the literature value of kCH4/k13CH4 = 1.0039 ± 0.0002. In addition, the kinetic isotope effects were characterized using transition state theory with tunneling corrections. Good agreement between the experimental, quantum chemical, and available literature values was obtained. Based on the results we conclude that the OH reaction (the main sink of methane) at steady state can produce an atmospheric clumped isotope signal (Δ(13CH3D) = ln([CH4][13CH3D]/[13CH4][CH3D])) of 0.02 ± 0.02. This implies that the bulk tropospheric Δ(13CH3D) reflects the source signal with relatively small adjustment due to the sink signal (i.e., mainly OH oxidation). How to cite: Joelsson, L. M. T., Schmidt, J. 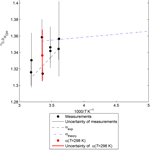 A., Nilsson, E. J. K., Blunier, T., Griffith, D. W. T., Ono, S., and Johnson, M. S.: Kinetic isotope effects of 12CH3D  + OH and 13CH3D  + OH from 278 to 313 K, Atmos. Chem. Phys., 16, 4439-4449, https://doi.org/10.5194/acp-16-4439-2016, 2016.